Delville Wood was sometimes known as Devil’s Wood, and the fighting there during the battle of the Somme was particularly ferocious. The majority of the wood was eventually taken by South African soldiers on the 15th of July 1916, and they held on grimly during numerous German counterattacks for six days, until they were relieved. 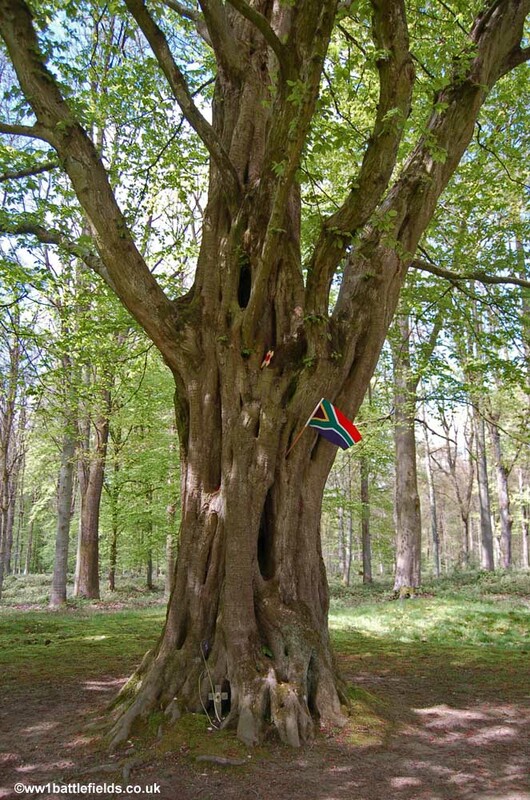 After the War, South Africa purchased the site in 1920, and it serves as a memorial to South Africans who fell, not just here but elsewhere. The best guidebook for this site and the Somme region in general is Major & Mrs. Holt’s Guide to the Somme Battlefields, which has recently been published in an updated, 100th Anniversary edition. Paul Reed’s excellent Walking the Somme has a walk which covers this area as well. 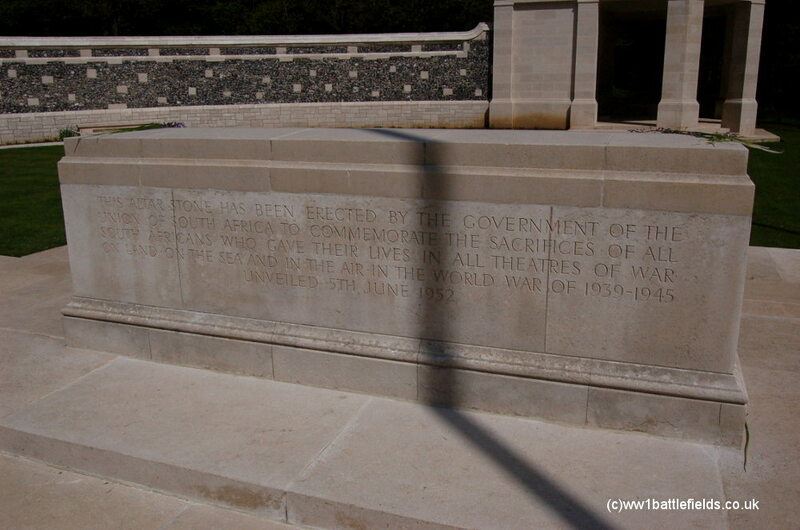 Delville Wood is 7 miles north-east of Albert. 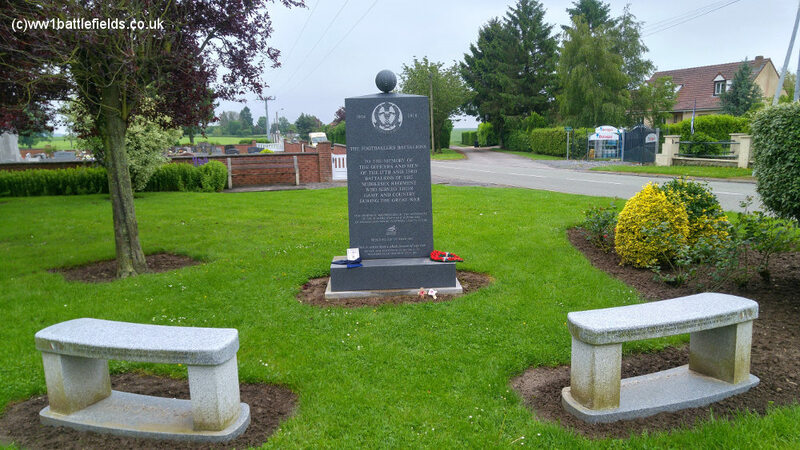 It is located just east of the village of Longueval, off the D20 that runs towards Guillemont. It is well signposted. There is a visitors car park, and also toilets, and there used to be a cafe with a small Great War related display and a shop. However this is now closed, although the car park can still be used. From the car park, the South African National Memorial and Delville Wood is to the left, whilst to the right a large CWGC Cemetery opposite the wood. There was very little left of Delville Wood after the war, as the photo at the top of this page shows. 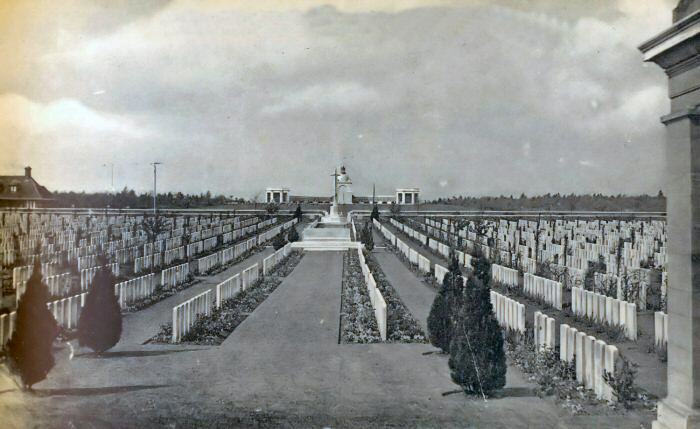 The original Great War memorial here was opened in 1926, and a photo taken shortly afterwards shows a row of very young trees in front of it. Today, the wood has regrown, and there are four rows of mature imposing oak trees in front of the memorial entrance. Depending on when you visit, there can be many acorns underfoot. As you enter towards the memorial, the ground between the trees to either side is still very uneven and cratered. 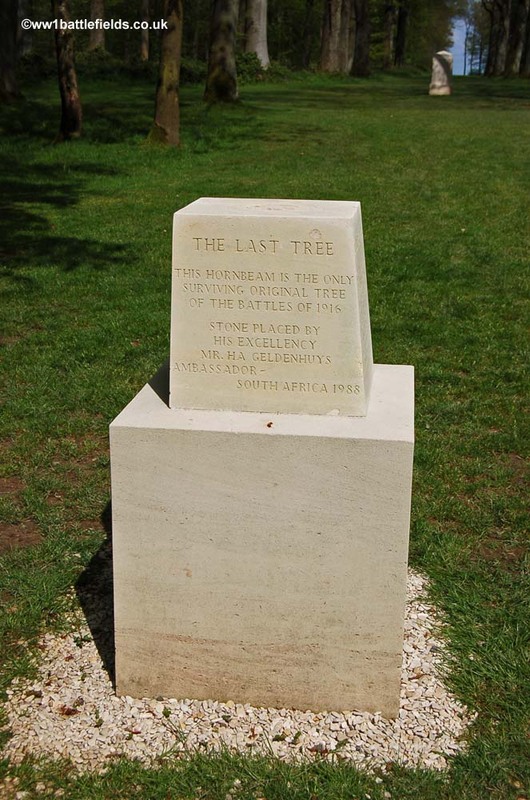 In front of the main entranceway of the original memorial is a large stone added later (on the 5th of June 1952) which commemorates South Africa’s fallen from the Second World War – see left photo below. The original memorial, unveiled in 1926, commemorates 10,000 war dead from the Great War and is surmounted by a statue of a horse and two men – see photo above right. This was perhaps intended to represent the two races of the Union of South Africa. It has also been described also as a statue of Castor and Pollux. 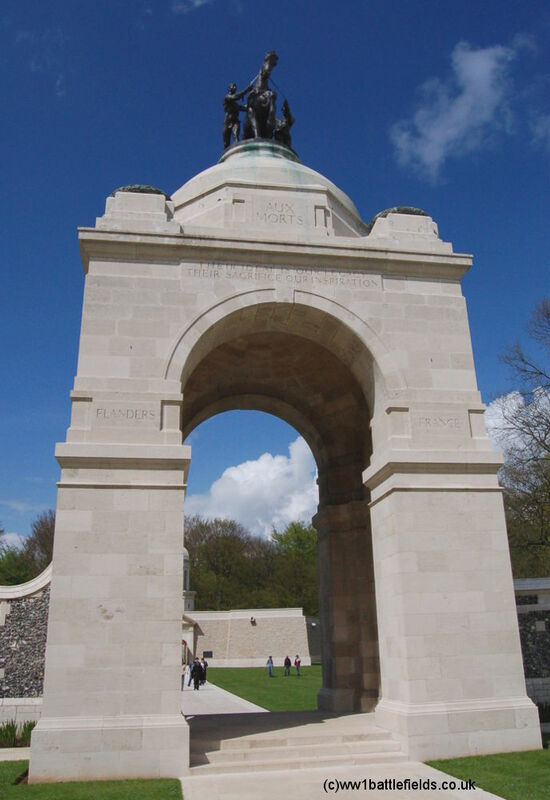 The names of areas where South Africans fought, including France and Flanders are inscribed on the memorial, and above the entrance arch are the words “Their ideal is our legacy, their sacrifice our inspiration“. This is a memorial to those who died, rather than to those with no known grave; there are no panels listing the names of the missing as at Thiepval. In fact those South Africans with no known grave are commemorated along with those from the United Kingdom at Thiepval and other memorials to the missing. However, the names of those from South Africa who died are also listed in a book kept at the museum, just inside the entrance. Behind the memorial is the museum itself. A stone laid on 7th June 1984 marks when building work commenced, and the museum itself was opened on the 11th November 1986, by Mr. P.W. Botha. The museum is hexagonal in structure, and inside are four large bronze panels on the outer walls. 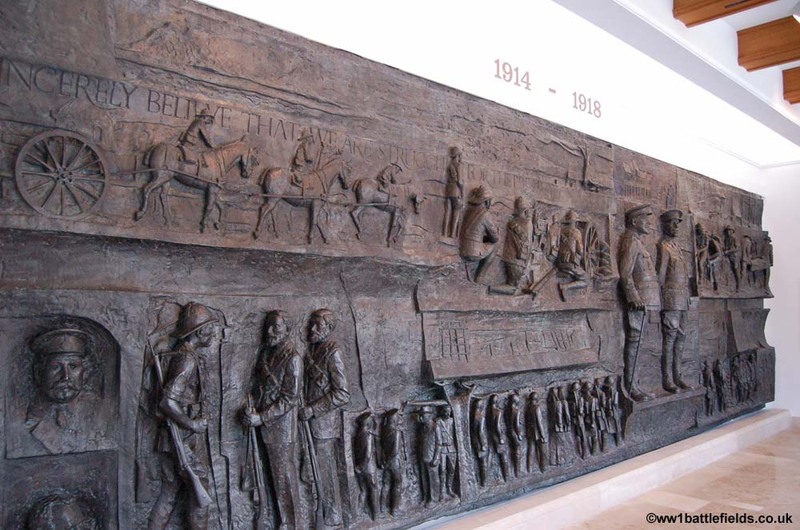 The first (to the left from the entrance) contains 16 friezes depicting various aspects of the Great War, whilst the next is devoted to the particular actions at Delville Wood in the six days 14th-20th July 1916. 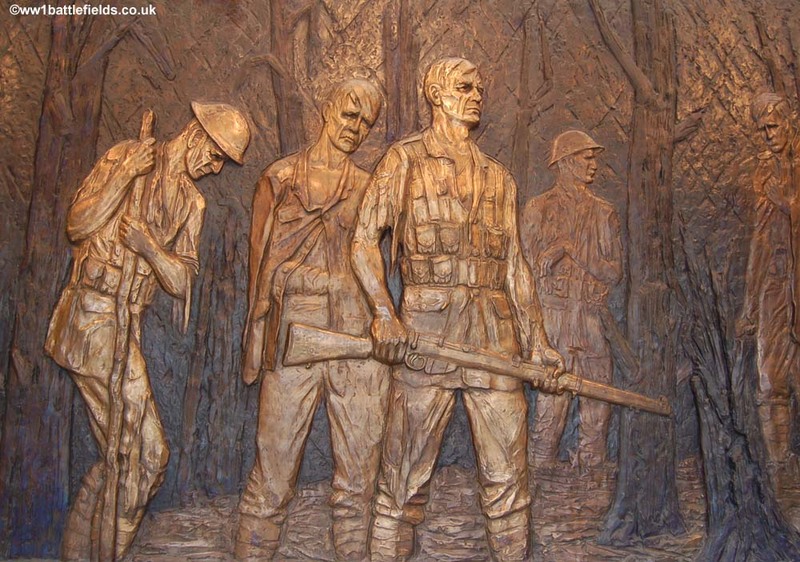 The third bronze also deals with the Great War, whilst the fourth covers the Second World War. Several of the inner walls contain large windows, and etched on the glass are the battle honours of South African forces. 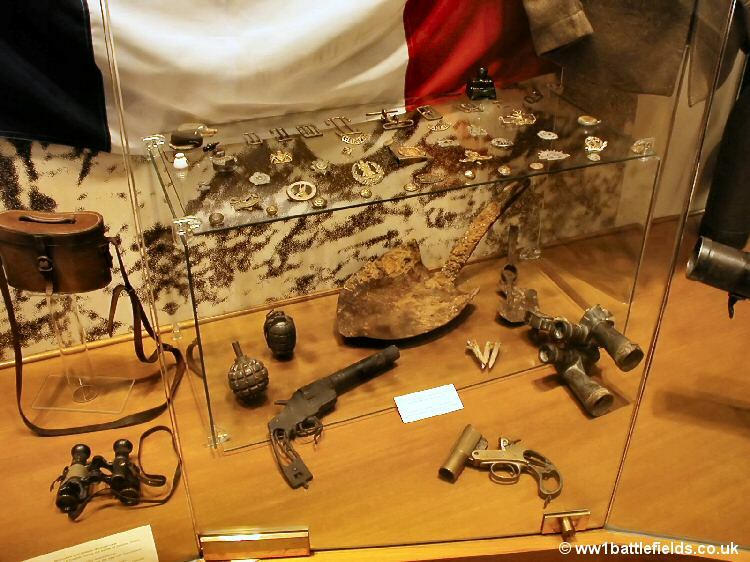 In addition, there are several displays within the museum, including battles relics found during the museum’s construction. In a separate display, the three South African VC winners are listed. 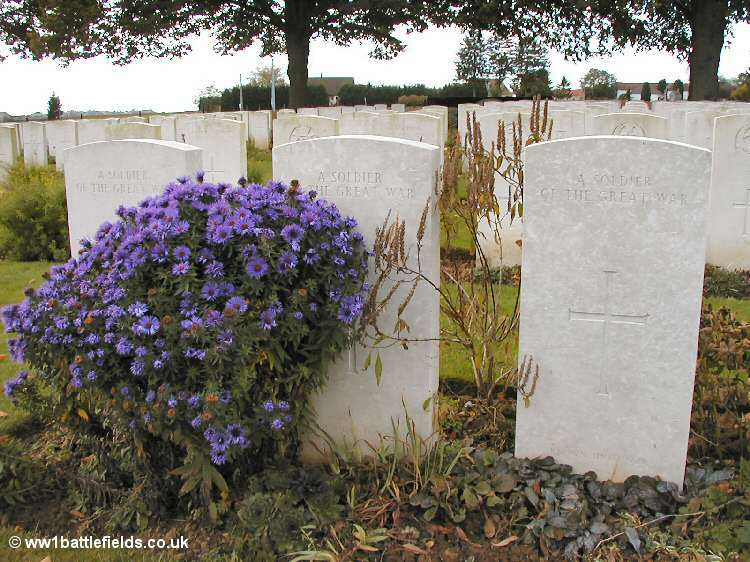 They include William Frederick Faulds (who won his VC at Delville Wood). Private Faulds, of the 1st Battalion South African Infantry, won the VC for rescuing wounded men under enemy fire on both the 18th and the 20th of July 1916. 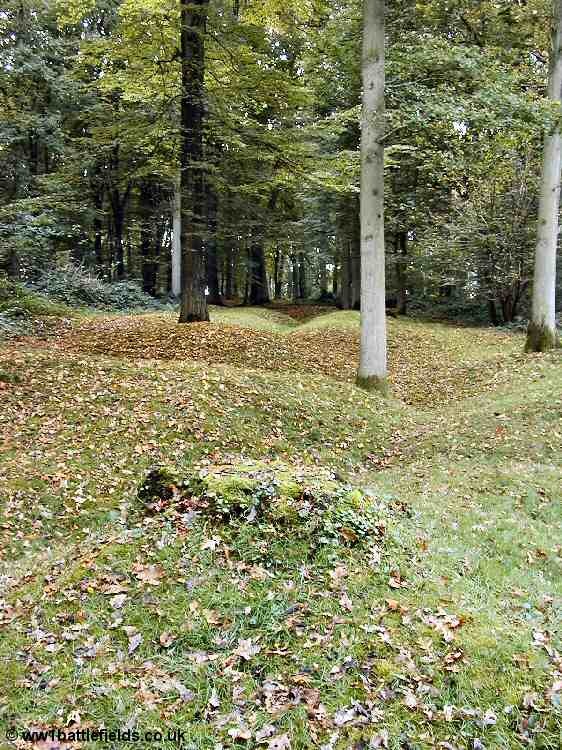 Beyond the memorial and museum is Delville Wood itself, now fully re-grown. It is possible to walk along the same “rides” or tracks that used to exist before and during the war. During the war, these were given street names by the soldiers who served here, and stone markers now record these. 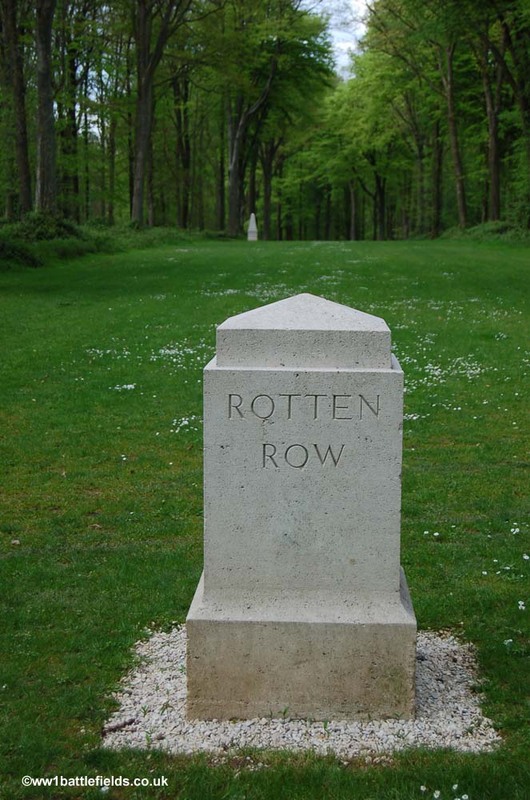 For example there are a number of London street names, such as Rotten Row (as pictured below), but others such as Princes Street and Buchannan Street suggest a link with Edinburgh. To the left rear of the museum is what is believed to be the last original tree to survive from before the war. This is marked by a stone marker. The remains of trenchlines can still be seen clearly in the wood between the trees. Just a little beyond this is a plaque commemorating two VC winners from the 10th Battalion Royal Welch Fusiliers (see left hand photo below). This was put in place in May 2001. 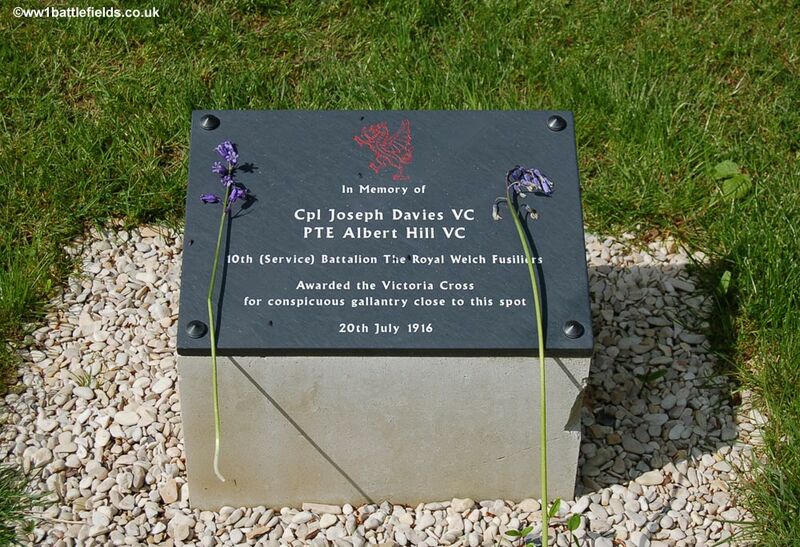 Corporal Joseph Davies (who came from Tipton in Staffordshire) was separated from the battalion along with eight other men on 20th July 1916, and during a German counter attack they were surrounded. He led a brave fight back and forced the German to retreat. On the same day, Private Albert Hill (from Manchester) also won the VC when he led an attack and later was surrounded by Germans but bravely fought on and escaped. He also later brought in a wounded officer, and captured prisoners as well. Both actions were part of a large attack on the night of the 20th July 1916, also famous for a ‘freindly-fire’ incident. 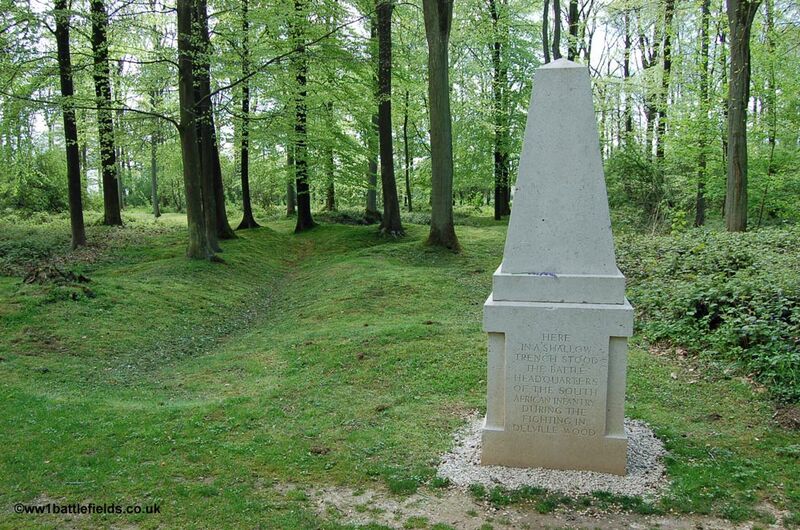 Continuing past the Last Tree and RWF VC plaques, and turning left down another ride leads to a tall obelisk which marks the battle Headquarters of the South Africans during the Delville Wood action (right hand photo above). The remains of a zig-zagging shallow trench can clearly be seen on either side of the ride between the trees. Walking today in this quiet and peaceful wood, the terrible fighting and hardship here is hard to imagine. In springtime, the wood is carpeted with beautiful bluebells. Yet the South Africans and other suffered extreme losses here, so much that only 113 of the 766 from the South African battalions who died here have known graves – a sobering thought. 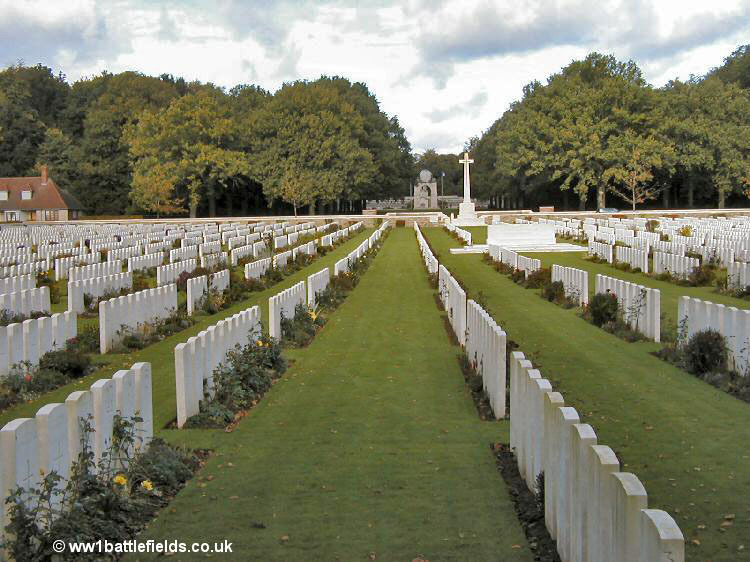 Across the road from Delville Wood itself is Delville Wood Cemetery. This cemetery does not date from during the war, but was created after the Armistice. It was made by the concentration of graves from a number of smaller cemeteries from the area around (including Bazentin-le-Petit, Courcelette, Guillemont, Loungeval, Maricourt and Martinpuch) but mainly from burials of those recovered from the battlefields. 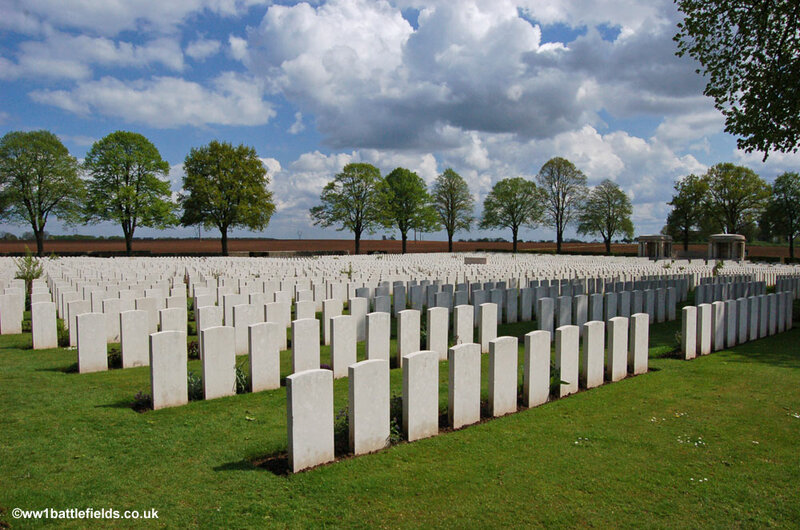 This is the third largest British cemetery on the Somme, with 5,523 graves. Despite the proximity to Delville Wood, there are relatively few (152) South African graves here. Almost all the burials are of casualties from the Somme who died during July, August and September 1916. Probably because of the several years that had elapsed when the bodies were recovered from the battlefield, nearly two-thirds of the burials are unknown soldiers. The photograph below left was taken from the rear of the Cemetery probably in the 1930s, and can be compared with a similar view today (below right). 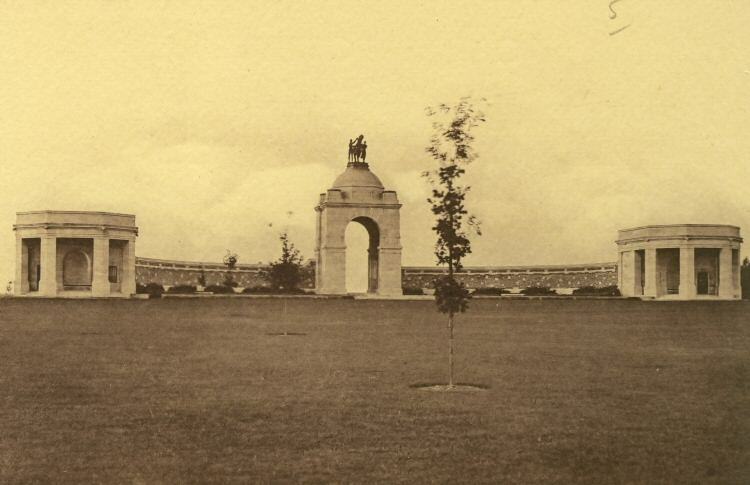 The South African Memorial is clearly seen in the older photo, and the new museum building is visible through the central arch of the original Great War memorial in the recent photo. Stone benches are set into the right and left walls of the cemetery, and on the right-hand side there are also special memorials to 27 men known or believed to be buried here. 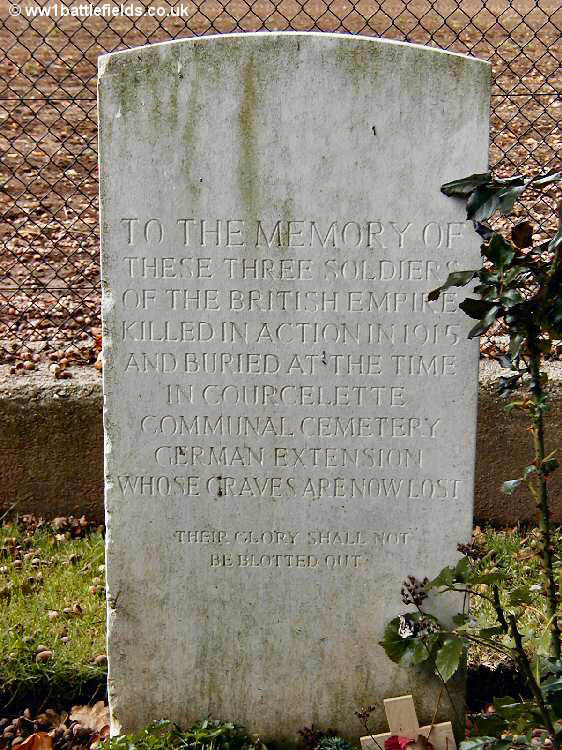 On the left side are special memorials to those soldiers whose graves in Courcelette Communal Cemetery German Extension were later lost – see left hand photo below. Three of the headstones in Plot 13 are much more recent than most others, and these mark the burials of three soldiers whose remains were found during the building of the museum at Delville Wood in the 1980s (see right hand picture above). They appear more marbled and much less weathered. 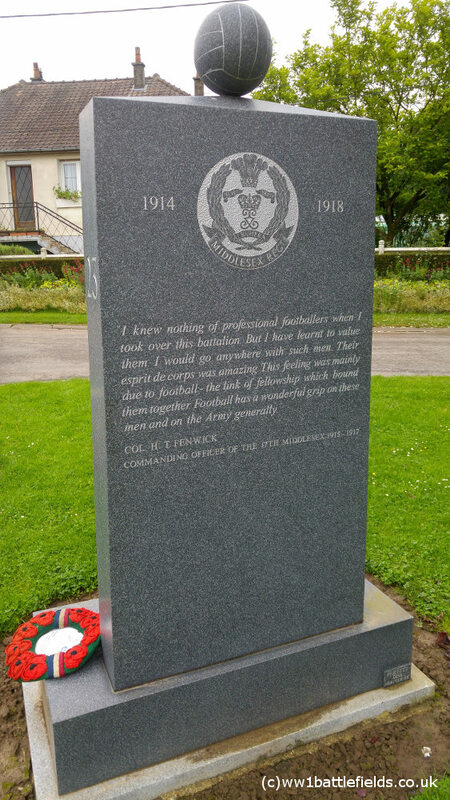 Returning to the car park, there is a small memorial plaque located in the flowerbed here which reads “Fred Crow RWF 1916 from his brother”. Private Fred Crow from Manchester served with the 1st Battalion Royal Welsh, died on the 19th July 1916, and is commemorated on the Thiepval Memorial as he has no known grave. 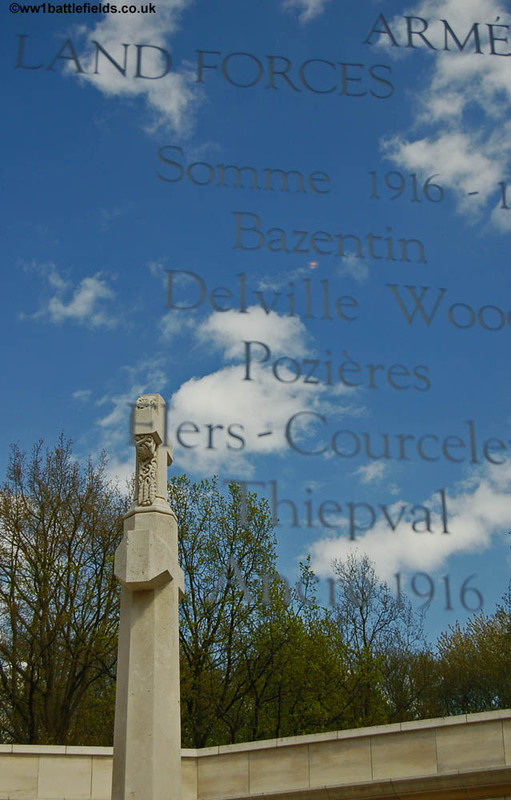 Nearby, at the corner of the road from Longueval which leads to Delville Wood and Delville Wood Cemetery, is a Memorial to the ‘Footballers Battalions’ – the 17th and 23rd Middlesex. Football continued for a while after the outbreak of the First World War, and the 17th Middlesex was started towards the end of 1914, as a battalion which footballers could join and still play for their clubs on Saturdays. Players joined from a number of clubs, and the 23rd battalion was started in May 1915. 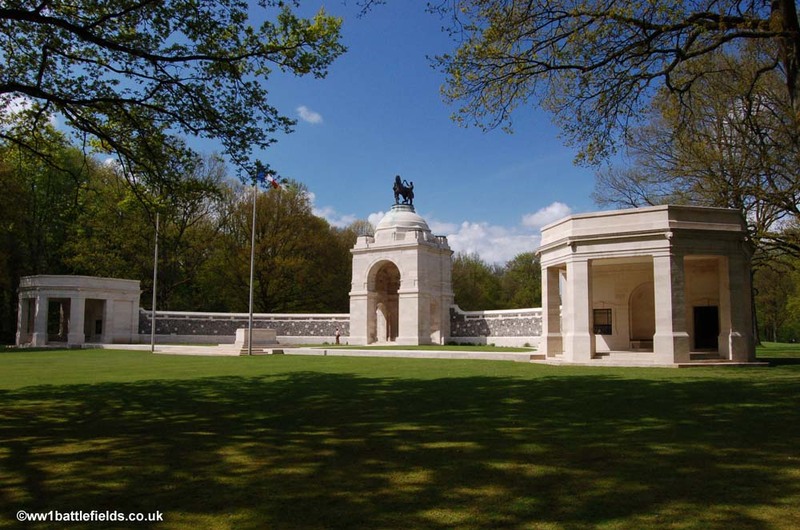 Both battalions fought on the Western Front, and the 17th at Delville Wood. 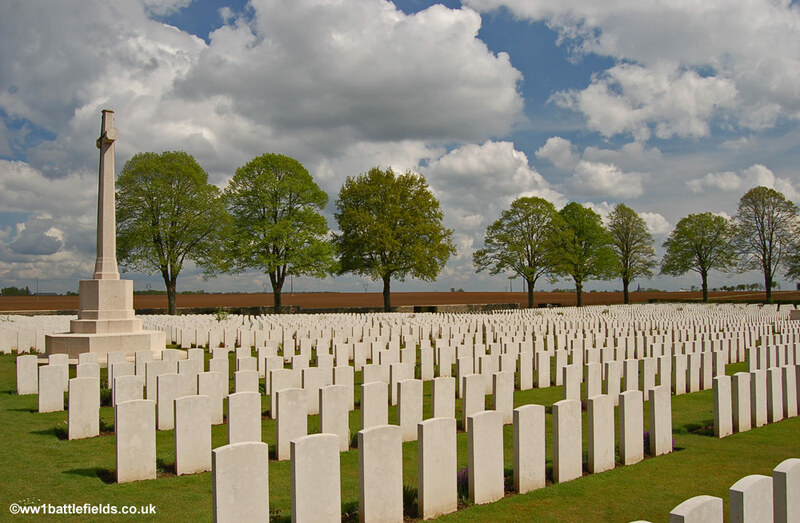 Many of these footballers fought bravely, and may died. The memorial was inaugurated in 2010, and a Wycombe Wanderers player, Gareth Ainsworth, blew a blast on a whistle to mark the event. On the front is a quote from the 17th Battalions Commanding Officer, a tribute to the bravery of the footballers who fought in the Great War.